Power BI is a powerful data visualization tool that can be applied to virtually any vertical. 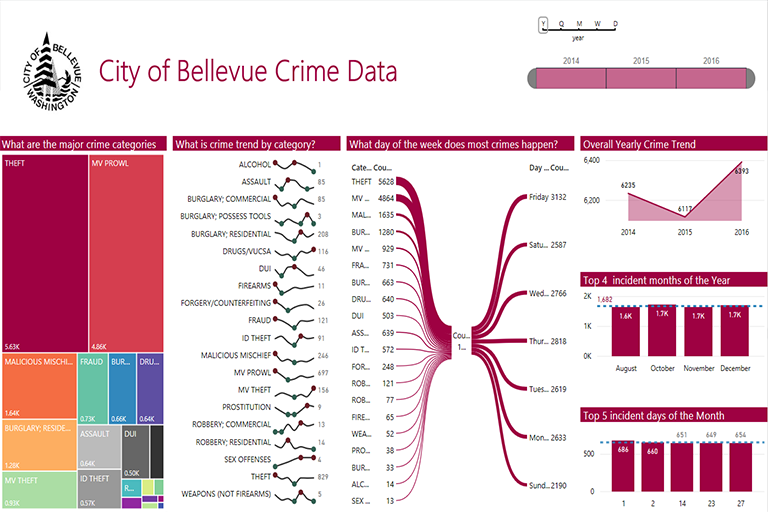 In this short demonstration video, Pactera shows how crime data can be used to gain insight into crime trends in the city of Bellevue, WA. Connecting to data sources is simple and intuitive with Power BI. Pactera used Bellevue’s raw crime data made public on the web. The raw data is downloadable as a CSV file. This file is roughly 39,000 rows and it is difficult to gain much insight from looking at the data in this format. 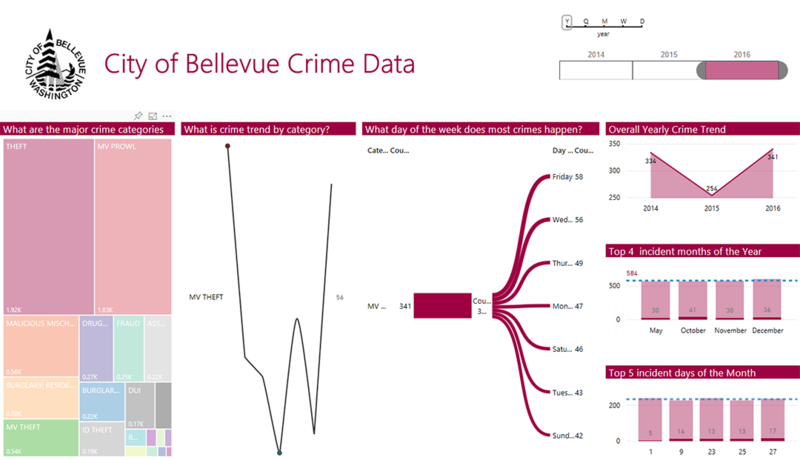 However, with the help of Power BI and its robust data dashboard toolset, Pactera made Bellevue’s raw crime data go from a static CSV file to an interactive data dashboard. 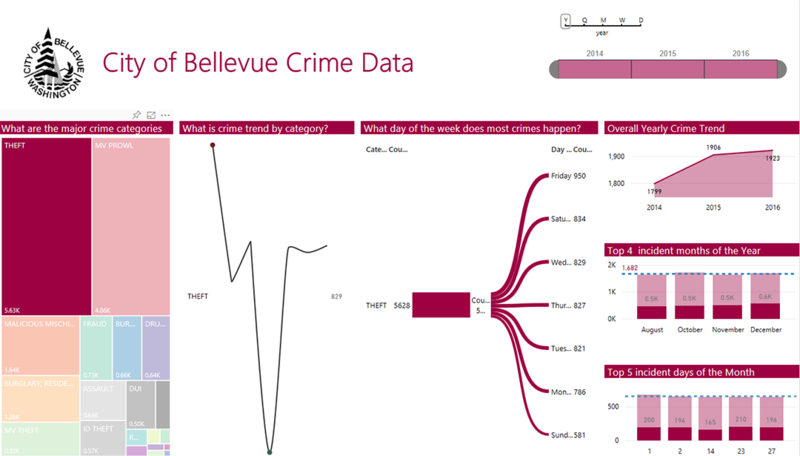 Raw data is easy to visualize with Power BI. For example, in the upper right corner there is a time selector where you can isolate crime data based on year, quarter, month, week and even day. Other categories such as major crime categories, trends by category, and days of the week most crimes happen are shown. Finally, there is a stack of three modules that show yearly crime trends, top four incident months of the year, and finally top 5 incident days of the month. The real power of Power BI is the ability to cross filter datasets for gaining deeper insights in real time. The standard view focuses data across three years. If we click into a specific year, the data is instantly filtered across all visuals to represent trends for that year. For example, theft was the most commonly reported occurrence in 2014 at 1,800 cases. In trends we can see that most of the thefts took place on a Friday. We accomplished this by using the quick transformation capabilities of power BI to convert a date into its representative day and weekday elements. We can also see how these trends have changed over the years in 2015 and 2016 by selecting the appropriate year. The convenience of Power BI’s interactive dashboard makes asking questions quicker. Let’s say you wanted to know which months of the year has the most occurrences of motor vehicle prowl. The answer to this question would be helpful to staffing sergeants who want to deploy enough officers. Selecting the year, in this case 2016, then gives you that view. We can see that the top four incident months where motor vehicle prowls occur are May, October, November, and December. Deploying more officers in these months would benefit than other months. 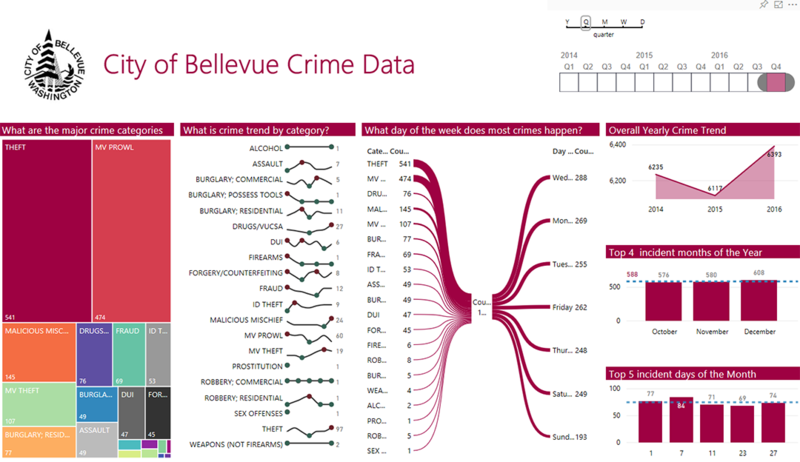 Pactera built this data dashboard using the City of Bellevue’s public crime dataset in just a few days. The features of Power BI allow users to derive deeper insights from raw data into useful information. 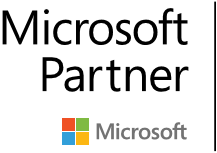 Pactera’s Power BI specialists and Data Scientists can help your organization achieve your business insights and goals with a very agile and quick turnaround approach. Pactera can be your partner in creating your data insights strategy.